PLANT NAME: Carica papaya L.
COMMON NAMES: Mïkana, hë’ï [Hawai’i]; papaya [English]; papaw [Eclectics]; mamaeiro (plant), mamao (fruit) [Brazil]; ababaï [Caribbean]; fruta de bomba [Cuba]; esi [Samoa]; lesi [Tonga]; ‘I’ita [Tahiti]; weleti [Fiji]; nita [Cook Islands]. Papaya fruit is made into candies, syrup, and numerous beverages. There are 119 calories per papaya. The green fruit is boiled as a vegetable and eaten with limejuice and sugar. The leaves and flower buds are sometimes used as food, but this may be a dangerous practice because of digestive enzymes in the plant. Water used for boiling should be changed numerous times. RANGE: Native to Mexico and Central America, papaya was brought to the Philippines in the 1500s. It is now found throughout the Pacific, South America, Indonesia, Australia, and Southern Africa. Certain papaya plants are male and bear no fruit. Traditional peoples will sometimes scar male plants and the resulting trauma causes them to become hermaphroditic, flower, and bear fruit. The technical term for this is “traumatic reversion.”One papaya plant can produce fruit for more than twenty years. Grows best below 1500 meters. Papain is harvested much similar to opium; the fruit is cut and the dried sap collected. TOXICITY: Tannins are present and can be harmful in large doses. Not during pregnancy. The raw seeds are used as birth control in some places. All parts can cause allergic reactions but particularly the sap. The sap can cause serious skin irritation topically and severe gastritis if taken internally. Papain can trigger asthma. There is a single human case report of hives and bronchial asthma from occupational airborne contact with papain [Quinones 1999]. Papaya flower pollen is also known to cause allergic responses [Blanco 1998]. Do not use when there is the possibility of coagulation disorders, as papaine is anticoagulant [Gruenwald 1998]. It is said that Native Americans fed Christopher Columbus so much food that he developed digestive pains. He was then taken into the forest and fed papaya. 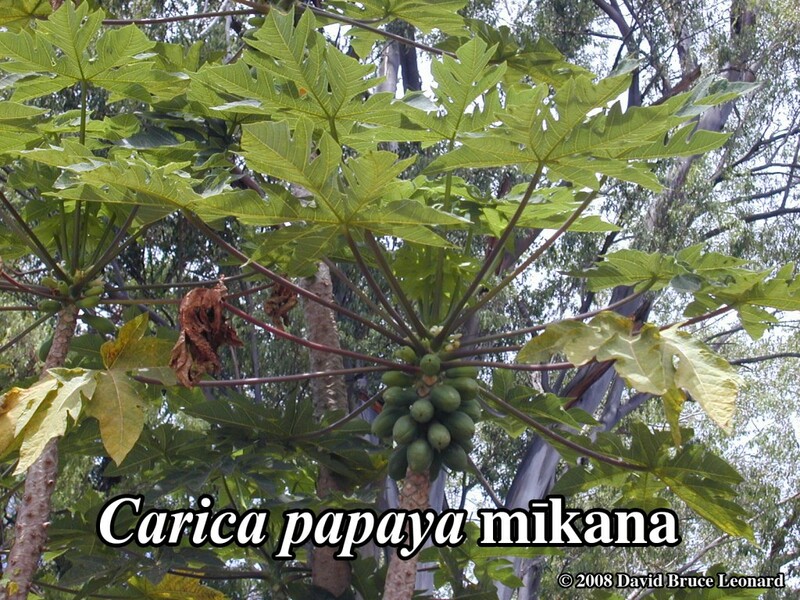 Carica papaya was first described in the Caribbean by the Spaniard Oviedo in 1526. One of four “power herbs” in the Philippines.